WSM’s Super Shredder features massive 48” dia. rotor in lengths up to 88”. 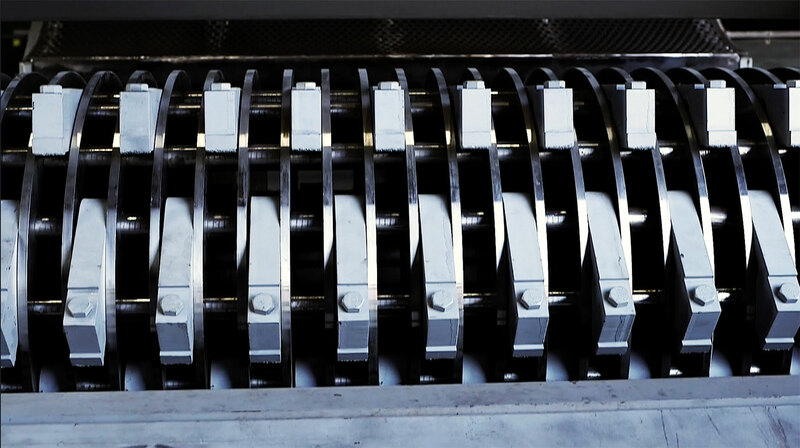 The massive size allows use of a single shredding/milling machine in the largest capacity applications, eliminating the need for multiple size reduction machines. Process high volumes of material to consistently sized fiber. These impressive machines can be fitted with single or dual motors – up to 1000 HP – and operate at 1200 rpm. The Super Shedder delivers high tip speed and two six screens providing a 240 225 degree arc of screening for more thru-put. Engineered and built for dependable use in 24/7 operations and proven in mill-duty applications with features like extra thick replaceable wear liners and modular sizing screens. The Super Shredder delivers reliable processing of a wide range of incoming feedstock in the most demanding environments. Change hammer tips and screens to adapt your Super Shredder to different applications. Multiple hammer options can be used to optimize performance. Change perforated screens to suit changing applications with WSM’s options from 3/64” to 3” diameter. Optional plenum flange in base allows for connection to air discharge or air-assist system. Years of field experience have gone into the design of maintenance features that make upkeep easier and safer. Hammer tips can be rotated to expose an unused face or replaced in the field with an impact wrench; or change to another tip style to accommodate different material. Alloy steel Anvil is reversible for extended life and is simple to replace when necessary. Modular Screens are easy to access, and replaceable with an array of WSM screen sizes to adapt quickly to a different material. Remove or service Bearing with rotor in-place thanks to WSM’s removable bearing support blocks. Heavy duty Modular Wear Liners are rotatable and interchangable for even wear. Hover over circles to see features of the Super Shredder. Reversible alloy steel anvil is heat-treated for superior wear life. Removable bearing support blocks allow for bearing service without rotor removal. Pivoting front and rear case for easy internal access, reducing maintenance and operating costs. Rotor shaft end is drilled and rifled on each end, permitting hydraulic bearing removal. Heavy-duty double row spherical roller bearings and cast pillow block bearing housings provide superior bearing life. Wide mouth opening for improved infeed. Heavy-duty fabricated steel housing for superior strength. Extra thick replaceable interior steel wear liners provide extended machine life. Rotor constructed with heavy-duty machined shaft, rotor discs and alloy steel hammer pins. Hinged breaker plate door with shear pin and limit switch to help protect machine from large uncrushables. Massive 48 inch (1220 mm) diameter rotor and up to 88 inch (2235 mm) rotor length. Modular screens are easily accessible . Multiple screen options available. Increased screen area for more through-put. Available with 4 – 8 rows of alloy steel rectangular hammers with optional replaceable tips. Optional plenum flange in base for connection to customer supplied air discharge or air-assist system. Direct Couple or Belt Drive options. Hammer pins constructed from high strength alloy steel with ends drilled and tapped for easier handling. Maximize production with optional feeder device for full width metered feeding of material across full rotor length. Heavy-duty drive base with motor mount for single or dual drive motor(s). The WSM Super Shredder is ideal for the demands of Green Milling or Dry Milling systems. Wood Fiber and Baled Fiber Processing systems rely on WSM component machines like the Super Shredder for consistent output. 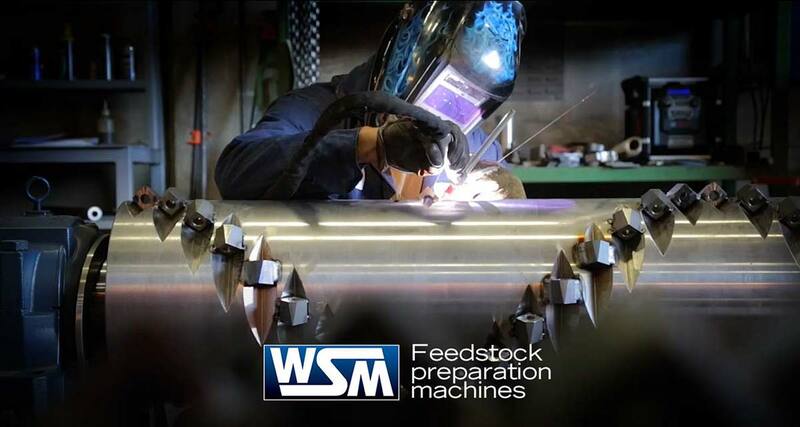 WSM combines grinding and milling machinery like the Super Shredder with our wide array of infeed and outflow machinery to form complete high capacity milling islands and complete processing systems. Find out if WSM Super Shredder are right for your application now.